“Dr. Austin B. Byles, of Los Angeles, Cal., has issued a neat little folder, describing and illustrating his new dog and cat hospital, which is admirably equipped for treating and boarding canine and feline pets.” This item appeared in the September 1917 issue of the American Journal of Veterinary Medicine. It’s notable because small animal medicine was neglected in this journal, which emphasized the bread-and-butter practice of livestock care until the 1920s. Pets were generally an afterthought among vets, who were not trained in their care. Most pet owners did their own home doctoring. (I’ll discuss more about home doctoring in future posts.) The exception to this was in big cities — New York, Philadelphia, and here in Los Angeles — where small animal practice was developing into a niche market with a well-to-do clientele. This is the brochure described in the JVM. It offers both interior and exterior views of the Dog Hospital, and looking closely at it reveals some important things about the emergence of small animal veterinary hospitals in the United States. Dr. Austin Beuzeville Biles was born in Ealing, London, England in 1878 or 1881 and emigrated to the United States via Victoria, British Columbia, in 1905. In 1912, in his Declaration of Intention to pursue American citizenship (he was finally naturalized in 1918), he listed his occupation as “Veterinary Surgeon.” He opened a clinic in Long Beach and also bred Airdale Terriers, registering some of his studs with the American Kennel Club between 1904 and 1911. 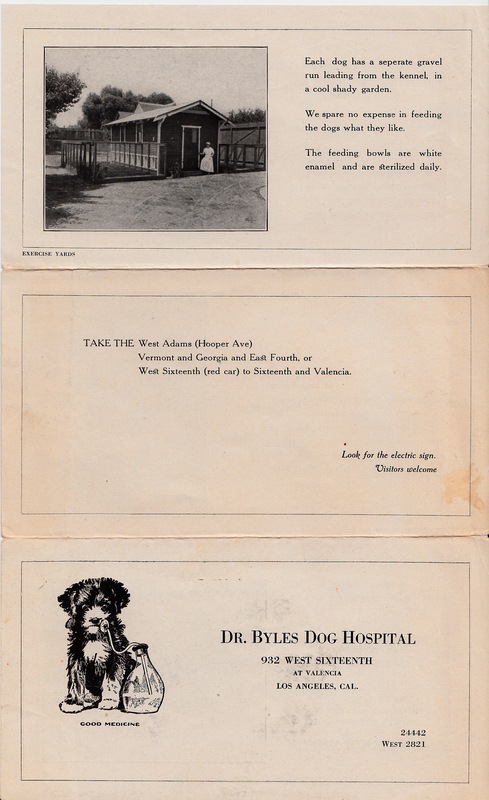 The brochure offered a view of the Dog Hospital, which seems to have been in a house converted to the purpose. Dr. Byles’ residence was apparently on the second floor, and the spacious, fenced back yard contained a kennel building for boarding dogs. The brochure’s pictures and text show that Dr. Austin Byles was aware that increasing numbers of pet owners regarded their charges as members of the family who were entitled to modern standards of care similar to what they expected to receive at their own doctors’ offices. 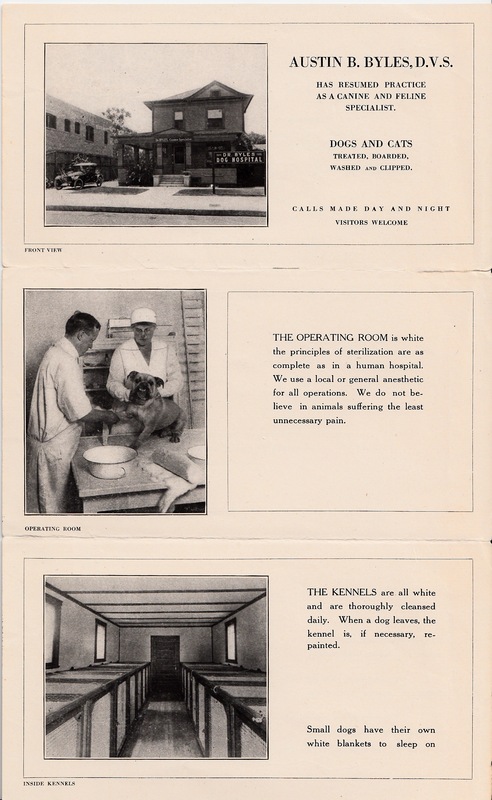 By the mid-1920s, more practices began to look like Dr. Byles Dog Hospital although small-animal small animal veterinary practice still had a long way to go. If you would like to learn more about the rise of small animal veterinary practice, turn to Susan D. Jones’ fine book Valuing Animals: Veterinarians and Their Patients in Modern America (Johns Hopkins University Press, 2003). I also discuss how people home-doctored their cats and dogs in my book Pets in America.